Rabka is an unusual town small town in that at its heart is a large woodland park with walks, cycle paths, tennis courts, children's play areas, go-karting, bouncy castle area and park restaurant. Children and families can enjoy a tour of the town centre by horse and cart, or horse and sleigh when it snows. A doll or puppet theatre provides additional entertainment for children plus there is an outdoor theatre with regular performances during the summer months. Located just 40 km from Zakopane and 60 km from Krakow, there are numerous beautiful places, national parks with an enormous variety of trails and footpaths, folklore and highland tradition to explore, all under an hour's drive. 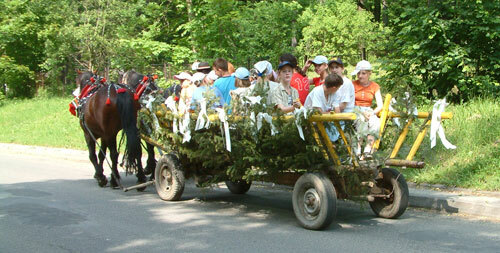 Imagine a town that has been developed with children in mind and Rabka Zdrój is the result. The starring role in Rabka is held by the Health Park which covers an extensive area in the centre of town. The park is very well used by locals and tourists. It provides plenty of outdoor entertainment in beautiful surroundings and is a must for anyone visiting Rabka. several walks in and around the town to nearby hills such as Maciejowa or Lubon, a way marked circular woodland walk, three national parks within half an hour's drive plus one you can walk to. 2 private indoor and 1 outdoor swimming pool. New Aquapark with flumes, sauna, solarium and outdoor geothermal pool etc. in Zakopane. Rabkoland - a permanent funfair open during the summer. outdoor ice skating rink open from 15th December until end of February. museum of local life, railway museum, 2 miles away in Chabowka, with working steam trains. Enjoy a ride on a steam train over weekends in June. plenty of local pubs serving food (around £3-£5 for main course and drink) and restaurants. One regional highland restaurant has live music until 3 am at weekends. cycle hire in town (see image on right for prices, e.g. 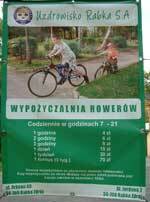 a week for 40 zlotys) and plenty of cycle paths and mountain biking. A holiday in Poland can be so much more than just a relaxing holiday - save money on a hair cut, beauty and dental treatment, plus various other good buys. Pamper breaks for ladies available.